When the May "Homespun Charm" kit arrived from Polka Dot Whimsy, I fell in love with the kraft patterned papers in the kit. I guess they were "the" items I wanted to save for the perfect project. Do you ever do that with your scrap supplies? I had been waiting on the kit to make a mini album for my niece, Reese, to document her Easter. (You can see it here.) After making the mini album, I was amazed with all the product I still had left over. I thought the floral pattern would work nicely with our "ready for church" Easter photos. There wasn't anything in the photos that would clash with the pattern. I had fun layering on this layout. I pulled out some border punches and had fun mixing some things up. 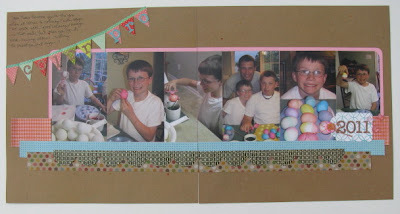 I continued with my Easter theme on a two-page layout also. For this page, I went with a solid kraft background and used just a strip of the polka dot kraft pattern mixed with some other patterned paper strips and some Pink Paislee border stickers. I thought the hand-stamped tag that Michelle included in the kit for May was adorable. The "doo-dahs" (butterflies and flowers) were nice little touches, too. I added some twine by Pink Paislee. I also added some mist (Mr. Huey by Studio Calico) to the kraft background paper before adding any of my other elements. (You can see in the photo below.) The border sticker I used for the base of my title gave me a little bit of dimension that was lacking in the flat alpha stickers by Echo Park. That concludes my work with the May kit. I did make a few other projects, but they are under wraps right now. I'll be able to share them throughout the month of July. This kit worked really well with your Easter pictures. I like how you layered the borders.